I'll try and get a couple scans in from the books I got.. This guy's amazing though..
Oh yeah, scored the Mort Cinder collected book on amazon a couple years ago. A friend of mine from school is friends with an animator named Raul Garcia. He is a big fan of Breccia too. He made a 3D animated short of the Tell Tale Heart by Edgar Allen Poe. Anyway his style for the film was directly inspired by Breccia. I've been TRYING to find it online, but no luck. For now the best I can do is a website for the film. I'll keep looking. It's pretty darn good I think. If you happen to come across any animation festivals where it's playing, check it out. Thanks for the info Mainloop great stuff. Yes, it's mo cap. Odd for a veteran Disney animator I thought. Y'know, I've heard Frank Miller go off on artists he says are "ripping off" HIS style, most notably Tim Sale, and Jim Lee back when he came out with Deathblow. But I've never hear him crediting Breccia for influencing his style. Maybe I haven't read all his interviews and maybe he has given credit, but it seems to me like he's trying to pass off his Sin City style as "completely original". I hope I'm wrong though. 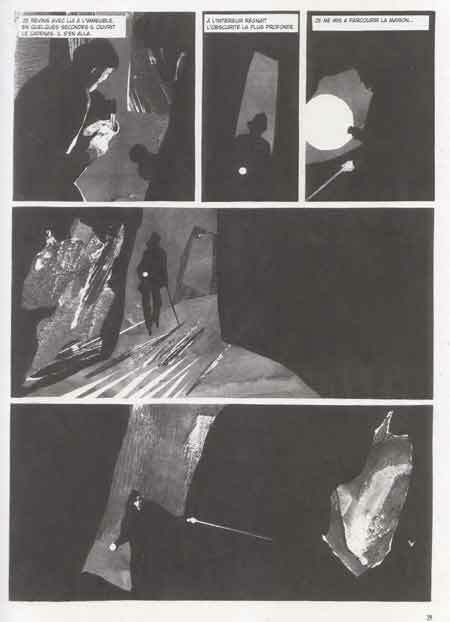 Mort Cinder came out in the early 60's and Breccia still influences artists today. Last edited by Silvertone; August 17th, 2008 at 04:34 AM. He's the man! He was so ahead of his time, incredible how in that quite stale period for comic illustrators in argentina he created a style that influenced comic artists worldwide. It's funny to see that Mort Cinder argentinian edition cover, finally after so many bucks spent on amazon and intl' shipping I can say that I only spent like 10 bucks on that one . Anyone interested in getting some of his material (in spanish of course) quite cheap, let me now. I could buy that here and ship it.